Allok MP3 WAV Converter is audio software that help you convert audio files from one format to another directly and on-the-fly. Allok MP3 WAV Converter is designed to meet all your needs of convert audio file between MP3, WAV ( PCM, DSP, GSM, ADPCM ), WMA, MP2, OGG formats. Allok MP3 WAV Converter main features include: Batch convert all supported formats to another format; copy or edit ID3 tag between all formats; playback audio files with its built-in player. Very quick in conversion speed and no quality is lost! Convert files in batches from WAV files into MP3 or Microsoft Media Audio (WMA) format and back. 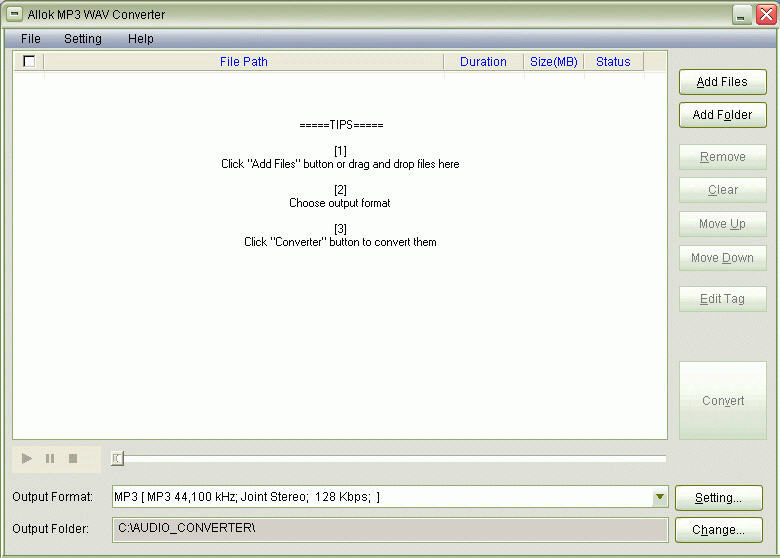 makes it convenient to convert the music in ASX, ASF, WMA and WMV formats into MP3 format.